We are not just some basic par 3’s and par 4’s like everybody else. You come here because you want to experience our full size par 5’s, water shots, multi-level greens and outstanding conditions. Prepare yourself for an unparalleled golfing experience. Our course is a pleasure for golfers of any skill level to play. The Peoria Pines Golf & Restaurant will challenge you while providing a relaxing, picturesque backdrop. Test your accuracy with our fairways, water hazards and sand traps; we have everything you need to challenge you and improve your game. All in all, our goal is to provide you with a quality experience that includes exceptional service and a comfortable atmosphere. 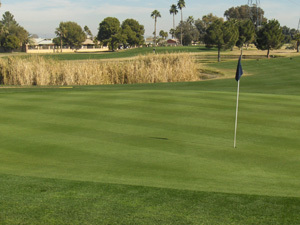 Whether you are a beginner or pro, Peoria Pines is a golf experience for you. With pace of play averaging about 3 hours, you can enjoy a fast yet unforgettable round of golf any day of the week.